Want to express yourself? 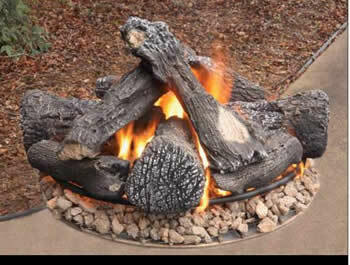 The Outdoor Expressions or Midnight Expressions fire pit is just for you. Create the look you want around our realistic gas logs using stone, brick, rock or tile. The possibilities are endless. The fire pit shown has landscaping stones around the unit. We have two different units. The Outdoor Expressions available in 11 1/2-inch stainless steel burner with about 60,000 btu's. Midnight Expressions available with a 24- or 30-inch stainless steel burner with about 85,000 btu's.The Midnight Expressions is the better of the two kits but both are just amazing for the price. The Mid Night Expression ships via freight company and shipping is generally around $135 app. This can vary. Call for quote if needed. 817.613.0029. Comes complete with the fire pit, stainless steel burner, logs, lava rock. Comes configured from the factory to burn LP but it comes with a conversion kit to change over to Natural Gas. This unit is designed for a permanent installation. If you are wanting a system to hook up to a portable propane tank look at the outdoor expression.